2010 saw some radical improvements to the facilities here in Can Alzina. We have some of the best horse facilites available anywhere on the the Iberian peninsula. 31 Brand new large German built Rower Rub stables. State-of-the-art, 6 horse indoor horse walker. Martin Collins all-weather indoor and outdoor arenas. Is the joint passion, the spirit and dedication of three families, Elías, Collins and Vilà. Núria Vilà, Annabelle Collins and us, the brothers Agustí and Lucas Elías, all live in Can Alzina and head Barcelona Horses. Quirze is the creator and motive force behind Barcelona Horses. His knowledge and understanding of the Spanish horse has produced a winning formula, consequently he has been selling Spanish horses to people all over the world for more than 30 years. Quirze was initially a Rejoneador, a bullfighter on horseback. In order to be a commanding Rejoneador, the bull fighter must have great skill and horsemanship. He has subsequently passed on his knowledge and understanding of horses to his two sons Agusti and Lucas, who are both highly talented Dressage riders. Quirze is also the proud father two daughters, Teresa and Julia. His current commitments are divided between the sale of quality Spanish horses and running the thriving Can Alzina Restaurant. Agusti is the son of Quirze and along with his brother Lucas is a chief trainer at Can Alzina, the stable location of Barcelona Horses. Agusti trained with double Olympic Dressage rider, Luis Lucio, and is currently a professional trainer of Dressage horses here in Can Alzina. Agusti has a skilled eye for the correct morphology of a Spanish horses, and has an extensive knowledge of Spanish bloodlines. So much so he could be equated to a Spanish horse Encyclopaedia. He has competed several times at Grand Prix level, and currently has a fine string of competition horses. Agusti has trained many horses to Grand Prix level and is a highly talented horse trainer specialising at in-hand work, aiding young horses to learn their first steps of Piaffe and Passage. Lucas is the son of Quirze and along with his brother Agusti is a chief trainer at Can Alzina. From 1997 to 2000, he worked for Double Olympic Dressage rider, Luis Lucio, before branching out on his own as trainer and International dressage rider. He has trained several young riders to become Spanish champions, and one of his students gained a prestigious bronze medal at the European Young Rider Championships. Lucas has many times been a pupil of the renowned German trainer, Jean Bemelmans, who has been a highly successful trainer of the Spanish Dressage team since the early 90s. He has been a successful Grand Prix rider and continues to excel in the Big Arena with his horse LAREDO. Apart from his talent on horseback he is credited with a top trainer status given the amount of students who he has trained to represent Spain internationally and on the National team. Annabelle was born and grew up on the island of Bermuda. 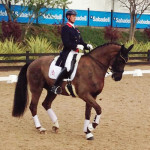 Before residing in Barcelona, she lived in Somerset, England for 15 years, where she helped run a successful horse farm whilst continuing her international dressage career. Her knowledge of the British and International horse market have made her a helpful addition to Barcelona Horses. In 2000 she graduated from Bristol University with an honours degree in Economics and Accounting, and subsequently worked as an Accountant for her family business. Annabelle has trained under some of the world’s best dressage riders, notably, Edward Gal and Nicole Werner, Diederik Wigmans and Leida Collins. Annabelle represented Bermuda at the Pan American Games in Rio de Janeiro in July, 2007, where she finished in a commendable 10th place. Currently she has a very good string of Grand Prix horses and talented young horses, and is aiming to represent Bermuda at the highest level in the near future. She is the principal contact for non-spanish speakers. Nuria was born in Barcelona and studied as an engineer at UPC Barcelona. From 1991 she trained under double Olympic Dressage rider Luis Lucio until she was 21. In 1997 she joined the team of Beatriz Ferrer-Salaat, where she remained for 7 years as the first rider in the team. Beatriz became Spain’s most successful ever equestrian, and won Olympic team silver and Individual Bronze medals at the Olympic games in Athens. In 2002 Nuria gained the coveted title of Spanish National Grand Prix champion on a Stallion called Zorro Z, and regularly competed in large International shows such as Lingen, Balve, and Norton-Harden-burg. Nuria is a very talented horsewoman who has trained several horses to Grand Prix level, not only that but also a highly respected trainer with her students winning at International Level.